Howdy! Welcome to Flawed yet Functional! Like many of you, I’m a mom, and I like to give my kids treats. What mom doesn’t? Since beginning my diet changes back in April 2017, we have committed to keeping the whole family on the same diet (There are a few caveats, but for the most part, it’s the same. Check out their thoughts here.). So where do fun, kid-friendly treats come in? Many are still possible with just a bit of tweaking. Today I’d like to show you easy homemade fruit jello that is quick to whip up and the kids can help! My primary goal in making gelatin from scratch is to eliminate additives, preservatives, food coloring, artificial flavors, and additional sugar. There is just so much junk in the boxed gelatin you can buy at the store! So I reached into my juice stash to make this gelatin without adding any additional sugar. These juice boxes (100% fruit!) are leftover from my insulin days when I would need quick glucose to fix a low. The stash has been sitting there for over a year just tempting my kids to drink it! Yes, I am one of those mom who does not give her kids juice! I used one box of juice and diluted it with water, because, again, I am THAT mom. Not only do I not give my kids juice on a regular basis, I surely don’t give it to them full strength! Juice is just pure sugar, folks; just like eating candy. Get off your soapbox, Emily! Ok, back on track. The gelatin I used was just regular Knox unflavored gelatin from the grocery store. I wish I had a grass-fed option on hand like this one, but I didn’t want to make a special trip out to the health food store. The kids wanted to make it now! Using a higher quality gelatin would make this recipe have actual health value. Gelatin/collagen has many health benefits! 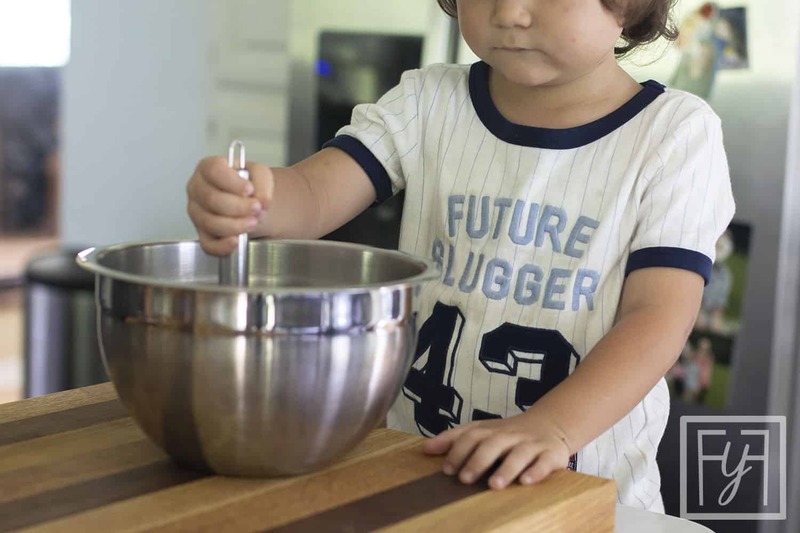 Let each kid make their own batch. Each boy chose his own flavor of juice, bowl, and whisk. Then I let each kid whisk their bowl of cold juice water and gelatin to let it bloom. Next, I poured in the boiling water while they continued to whisk until the gelatin was thoroughly mixed (And what kid doesn’t like to whisk??). Each boy continued whisking while I poured in the remaining juice water. Now it’s time to assemble the cups! Let your kids put the fruit into the dessert cups. 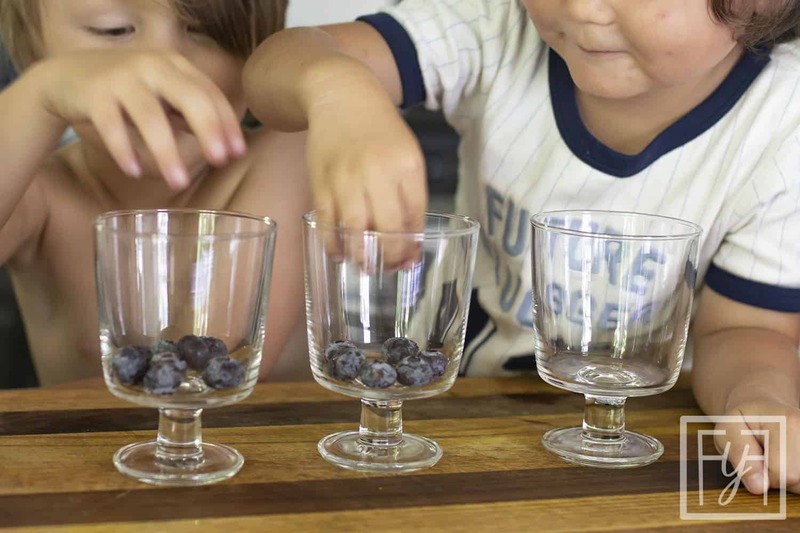 The boys, oh-so-carefully, filled the bottom of their cups with blueberries then I poured the gelatin on top. We were all having such fun and everyone was getting along that I thought I could get a good picture of them. Nope. This is what I go when I asked them to smile. Oh well! To be completely honest, I sort of dreaded starting this treat with my boys. They had asked for it, and I already said yes. However, the thought of making a mess in the kitchen on a hot day just didn’t sound appealing. Boy was I being a Negative Nancy! It took less than 10 minutes including taking pictures! It was so fast that my boys stayed interested the whole time, and that’s saying somethin’! Even if it does make a mess, the memories are worth it, right? Let me encourage you to look for treats to give or make with your kids even if you are on a restrictive diet. There’s always something! Gelatin is a naturally occurring ingredient and is good for you (so as long as you don’t add tons of sugar). Feel free to enjoy this sweet treat! 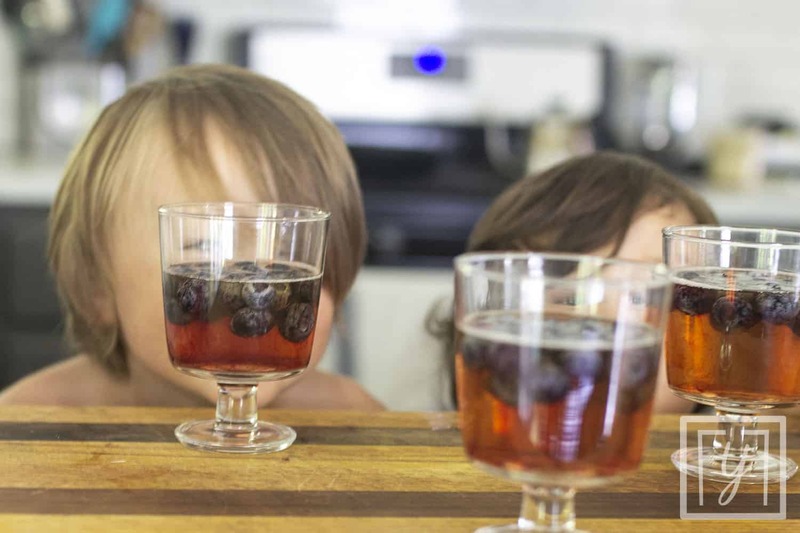 Make this Homemade Fruit Gelatin with your little ones today! 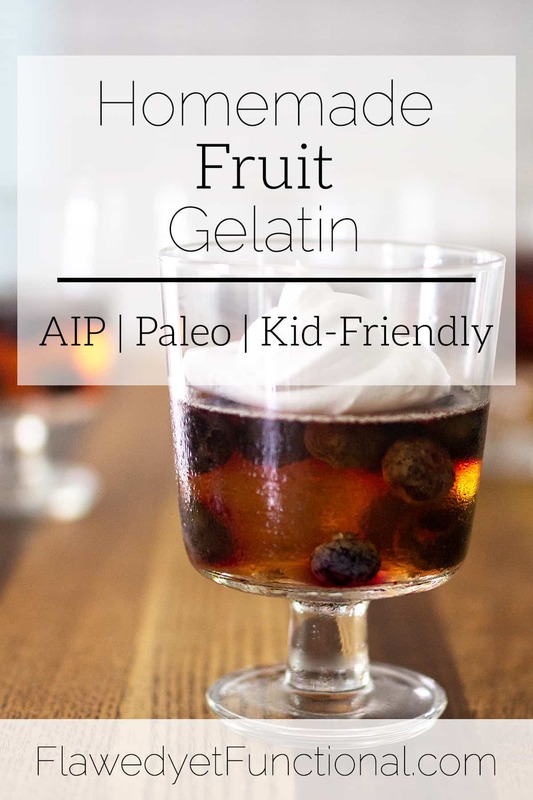 Making your own fruit-filled gelatin (AKA Jello) is a quick, easy snack or dessert you can whip up with your kids in 10 minutes flat. It is free of major allergens making it a great choice for gluten-free, dairy-free, and egg-free diets. 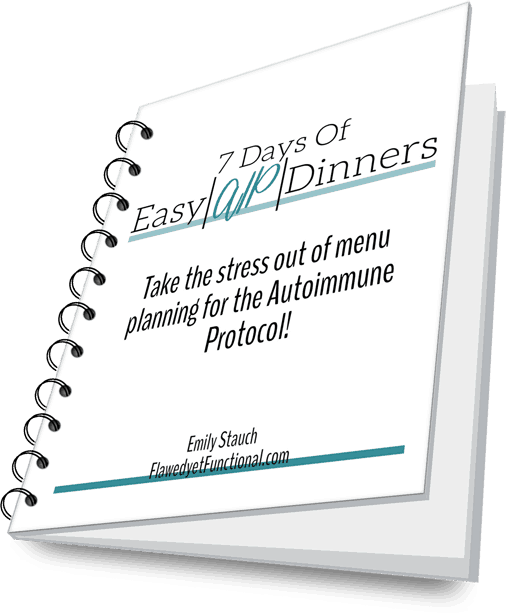 It is also low-carb and Paleo and AIP-friendly! In a glass Pyrex measuring cup, mix the juice and 1 cup of cold water. Pour 1/4 cup of the juice water into a small mixing bowl and whisk in the gelatin until it thickens. Once thickened, pour in the 1/4 cup of boiling water and whisk until completely dissolved. Then stir in the remainder of the juice water. Put berries in the bottom of dessert cups and pour the gelatin over the top. Place the dessert cups in the refrigerator until set, 2-3 hours. Eat as is or top with coconut whipped cream. Enjoy!